As the next installment of my 30 day challenge, I’m going to cut down on the amount of espresso I drink. 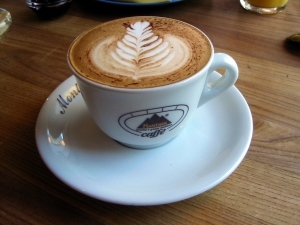 Anyone that knows me will attest to my love of coffee, it doesn’t matter if it is straight espresso, cappuccino, filter coffee or even good quality instant coffee – say the word and I’m there. Turns out that after spending about 3 seconds thinking about what I eat across the course of a week, coffee but more specifically milk plays a large role in my intake. Right now you’re probably thinking milk isn’t so bad, it is even good for your bones. When you eat cereal for breakfast, have 4-6 cups of cappuccino throughout a day during the week and then top that off with 2-3 cups of instant coffee in the evening – its a lot of milk; I’d estimate no less than one litre per day during the week. So while the object of this 30 day challenge is to drink less cappuccino, that is really a means to an end of drinking less milk. I love coffee and don’t want to have to give it up entirely but I recognise that drinking that volume of milk per day certainly isn’t helping my slow & steady weight loss goals. My goal is simple, no more than one cappuccino per day. I’m happy to replace any cappuccino that I don’t have with something that has no milk or vastly less milk but I’ve decided that drinking 200-250ml of milk per coffee isn’t helping me at all. We share a passion for drinking coffee Al. I love it but cant stomach instant anymore! Good luck with your challenge ???? We can abstain from coffee together Al! Although your motive is definitely more voluntary than mine! In the past two days I have discovered that Elsie doesn’t digest my breast milk properly if I have had a coffee to begin the day. Full Cream Milk and also Less Fat Milk contains some sugars (I guess even natural ones) that bubs find hard to digest. Since staying clear of milk, Elsie has been 100% better with wind, less spewing & seems a lot more settled too. It definitely is hard to refrain from giving up something that not only tastes good (especially if you haunt a local cafe for fine coffee daily!) but also something that serves as a daily ritual that relaxes the senses and mind somehow. Well, that is how I experience my daily fix! I will try including milk in my diet again when Elsie is older, her stomach may handle it better – fingers crossed. Good luck on your 30 Day Challenge, I have no doubt you will feel better for it too.